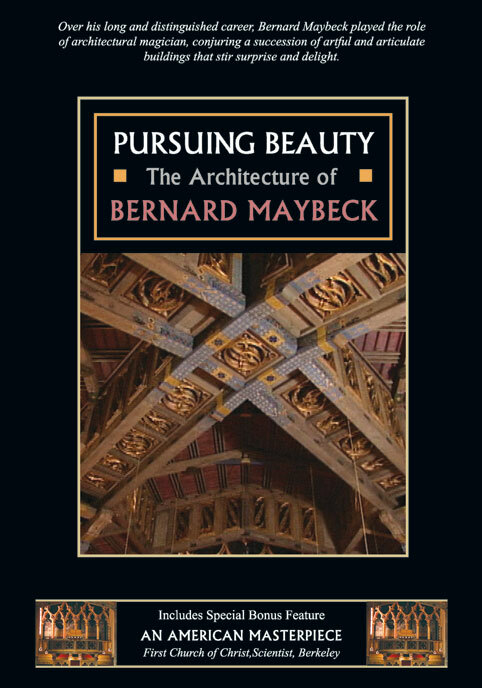 PURSUING BEAUTY: The Architecture of Bernard Maybeck tells the story of a 19th century romantic who used 20th century materials to create buildings that speak across time. The body of work that Maybeck created is remarkably diverse�by turns antique and modern, rustic and refined, theatrical and sublime. His projects reveal an original vision, a reverence for nature, a commitment to community, and a deep and abiding love of beauty. Over twenty of Maybeck�s important works are featured in Pursuing Beauty, including his best known project, the Palace of Fine Arts in San Francisco. Also seen are Hearst Hall at the University of California; Wyntoon in Siskiyou County;: the George Boke, Andrew Lawson, J.H. Senger, and Albert Schneider houses, all in Berkeley; the Samuel Goslinsky and Leon Roos houses in San Francisco; First Church of Christ Scientist in Berkeley; the Guy Hyde Chick House in Oakland; and several buildings at Principia College in Elsah, Illinois. Commentators include Kenneth Cardwell, Robert Judson Clark, Allan Temko, Richard Longstreth, Gray Brechin, Cherry Maybeck Nittler, Sheila Bathurst, Ursula K. LeGuin, Nancy Genn, Robert Craig, and Jeanne Colette Collester. The 86-minute documentary was written, produced, and directed by Emmy Award-winning producer Paul Bockhorst, in cooperation with the Berkeley Architectural Heritage Association. The documentary is narrated by Richard Doyle. Original music is by Paul Morehouse. John Rogers did the principal photography. Major funding was provided by the Windgate Charitable Foundation, the Gensler Foundation, Jeanne Colette Collester, Willard Hanzlik, Fred and Jury Porta, and the family of Charles Hosmer. SPECIAL BONUS FEATURE ON DVD: The DVD for Pursuing Beauty includes a separate mini-documentary entitled An American Masterpiece: First Church of Christ, Scientist, Berkeley. The 16-minute video provides a lyrical account of one of Bernard Maybeck�s most critically admired projects.